My time in St. Petersburg brought both challenges and excitement. Following five semesters of Russian at Cornell University, I studied the spring of my junior year at Smolny, the liberal arts branch of St. Petersburg State University, through Bard College. 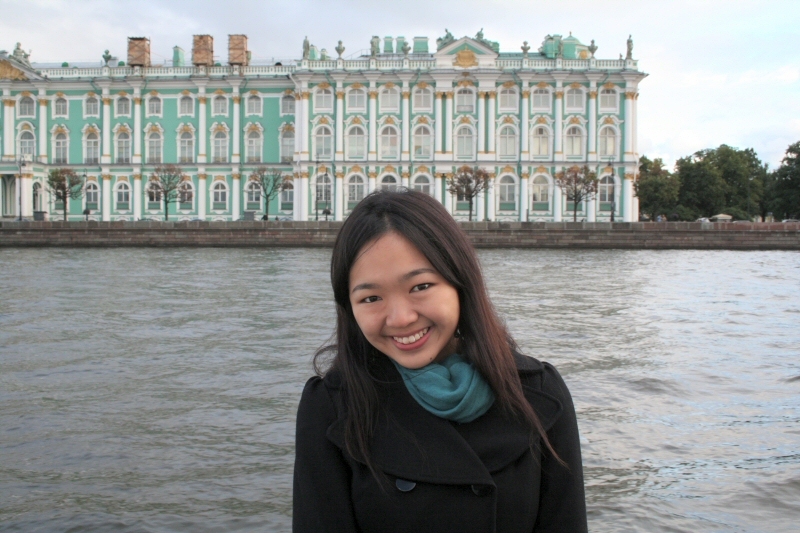 If you are considering studying in Russia, hopefully this testimonial will be useful to you! 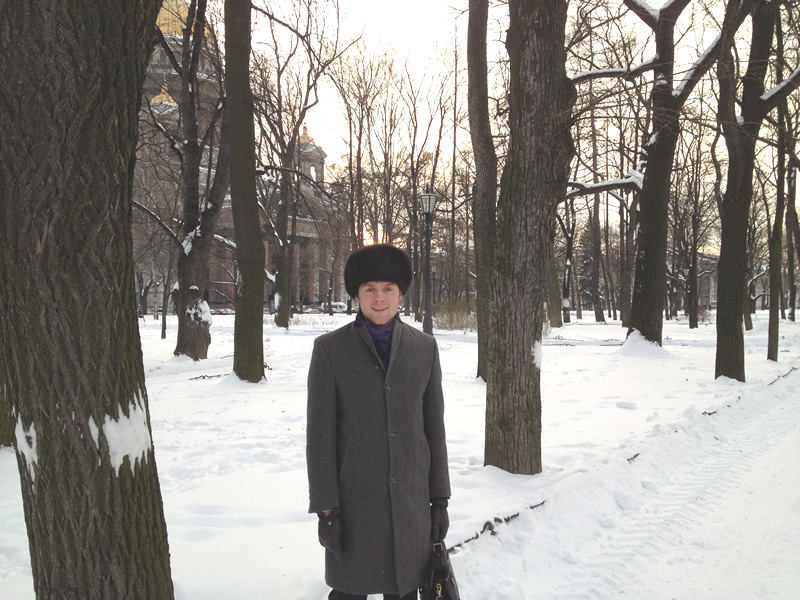 I arrived in St. Petersburg at the end of January, which meant I endured quite a bit of that famed Russian winter. In St. Petersburg, the weather was not so bad. The only times I felt truly miserable were days I didn’t dress appropriately for the temperature. Winter even offered some adventures like walking across the frozen Neva. I lived with a host family, which allowed me to practice my Russian every day. 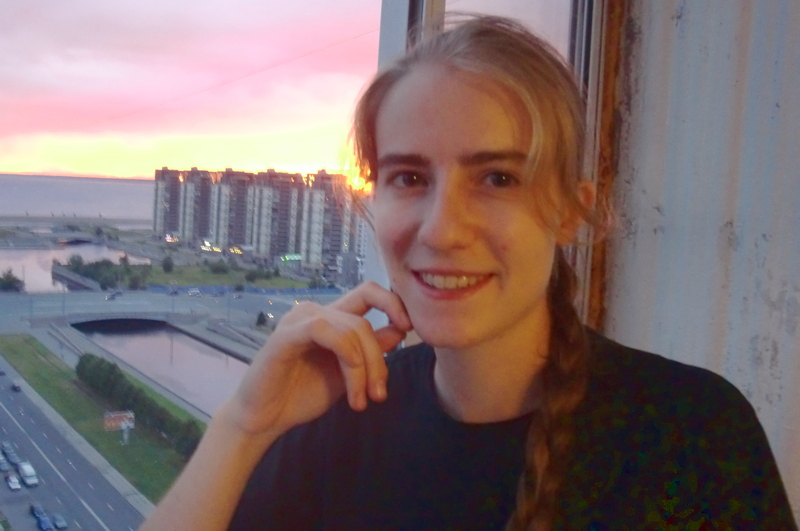 I loved getting the chance to experience Russian life in a Russian apartment. My host mom made me breakfast and dinner on weekdays and also lunch on weekends, so I was exposed to a variety of Russian foods and didn’t have to worry about preparing my own meals. The apartments in St. Petersburg are small compared to what Americans may be used to, but the adjustment was not so difficult for me. My host family was welcoming and eager to include me in cultural events – International Women’s Day, Easter, and Victory Day. Through my conversations with my host parents, I also became familiar with what many Russians think of Americans, President Putin, and the current international political climate. What did I learn from the experience? I would say that I learned quite a bit about the Russian mentality towards politics and culture and history through conversations with Russians that I was clueless about before. One memory sticks out. When my program traveled to Veliky Novgorod, a friend and I met up with a couple in their thirties whom we had met in Budapest. They gave us a tour of some churches and then invited us to have tea at their apartment. We talked for several hours about politics and religion and gender and World War II. They are religious Russian Orthodox people and are very supportive of the Russian government's conservative attitudes towards non-traditional sexual orientations. Generally, they back Putin's efforts to present Russia as a strong player on the world stage and are very sensitive about history (WWII) repeating itself. They also had views about America being superficial and super liberal. Still, they were very passionate about recognizing us as friends and were so generous to us. Also, this couple was very hopeful for the future of Russia. They genuinely believed in the promises of the government for economic and national security. What I took away from all these conversations was a widened perspective. I was better able to understand why they felt the way they felt considering religious and historical factors and why the government's program might appeal to so many seeking assurances. Living in St. Petersburg was never boring. The city was easy for a student to navigate. The city center is walkable and the metro, bus, and street car routes are straightforward. St. Petersburg offers so much from theaters to museums to restaurants and clubs. As students of St. Petersburg State University, we gained free passes to several art museums in the city, including the Hermitage. The Mariinsky Theater, which has three locations within walking distance of the Smolny campus, has performances every single night with affordable tickets. The Mariinsky and other companies in the city offer world-class opera, ballet, and symphonic performances. St. Petersburg even has an excellent jazz scene with numerous jazz clubs. The academic program at Smolny was manageable and designed so that we would also have time to explore the city and participate in the cultural program. 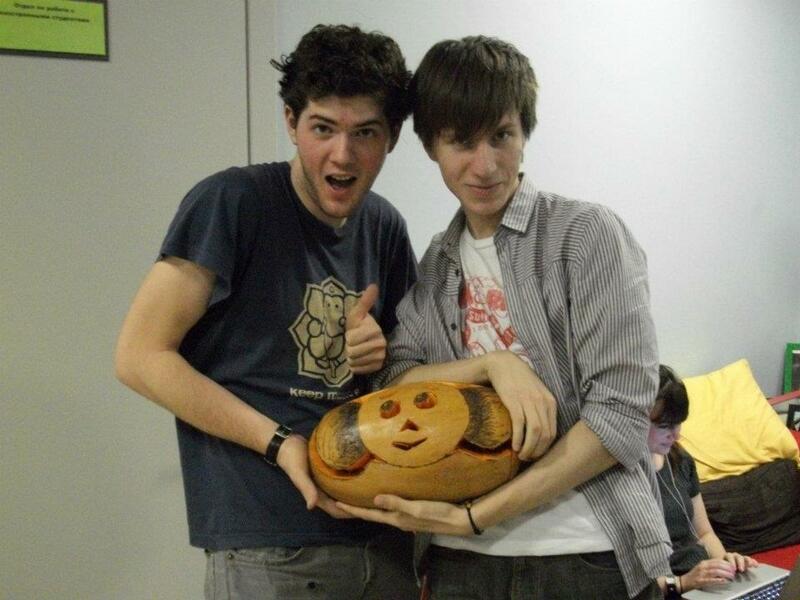 We had Russian language coursework as a part of the Russian as a Second Language Program. The instructors were excellent and really tried to make the coursework apply to each student’s interests and academic goals. 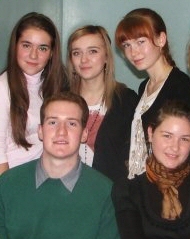 Since students came from all different universities, we were split up into different Russian classes based on our level. I also took two academic classes at Smolny, one on Russian literature and one on Cold War History. Although I sat in on a history course taught in Russian for the first half of the semester, I decided to take both of my academic classes in English. The Bard-Smolny program offered cultural events, including weekend trips to Moscow and Veliky Novgorod, throughout the semester. My favorite of these was a ballroom dancing class at Yelagin Palace in St. Petersburg. 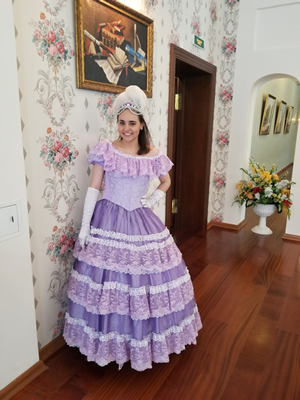 We all dressed in 19th century ball gowns and dress clothes and learned to waltz. The program encouraged interactions between American and Russian students by inviting Russian students to attend cultural events with us. We were given Russian buddies, also students at Smolny, as well as a Russian language tutor who was available to help us with our language skills. In turn, we could serve as English tutors to our fellow Russian students, which I found to be another great way to make friends with my classmates. I felt less than confident in conversing with Russians, and the struggle for me, especially towards the end of the semester, was in talking in Russian with Russians instead of in English with my American classmates. Still, it is so important to step out of your comfort zone and always try to speak. Almost always, Russians were patient with me. At the end of our program, we celebrated on a boat ride through the canals of St. Petersburg and on the Neva. It was the perfect ending to a journey of discovering another city and culture and my place in a global community. Still, I hold the memories (and many pictures) of my experiences and am so grateful for the opportunity I was given to spend a semester abroad in Russia. Моя программа в Санкт-Петербурге (the Bard-Smolny Program) была отличным опытом — я очень рад, что решил участвовать в ней. Я удивился, как быстро я начал понимать всё больше и больше. Занятия по языку, конечно, были очень полезны, но не совсем идеальны. Темы были довольно узкие и не очень практические, разговоров на занятии было мало, за исключением курса по фонетике — жизнь совсем изменилась, когда русские начали понимать моё произношение. Я начал думать, что многому научился, и стал говорить увереннее. И очень полезно было просто жить в Петербурге и жить у хозяйки, которая ни одного английского слова не знает. 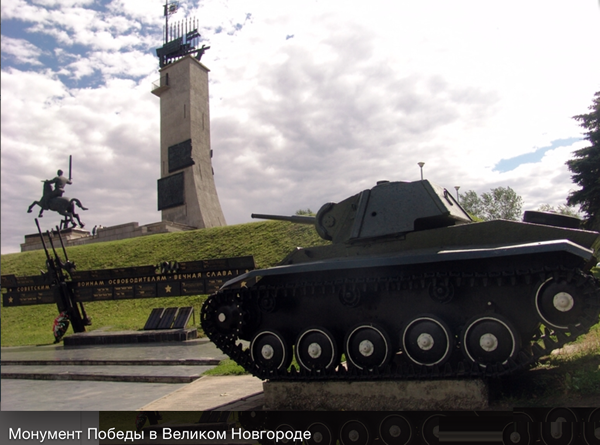 Петербург мне очень понравился. Всё там гораздо дешевле, и для большого города он не слишком шумный и перенаселенный. Я часто ходил в Мариинский театр, потому что самые дорогие билеты обычно стоят гораздо меньше, чем самые дешёвые в американских театрах. К концу программы я готов был вернуться в Америку, где можно купить зеленые овощи и кофе. В Петербурге единственное зелёное блюдо — это укроп. Но я как-то привык, и сейчас я так люблю гречку, что я купил немного, чтобы взять её с собой в Америку (греча у нас, наверное, есть, но в моем маленьком городе будет трудно её найти). Большое спасибо моим учителям в Корнелле за помощь. Я был очень хорошо приготовлен к этой программе. 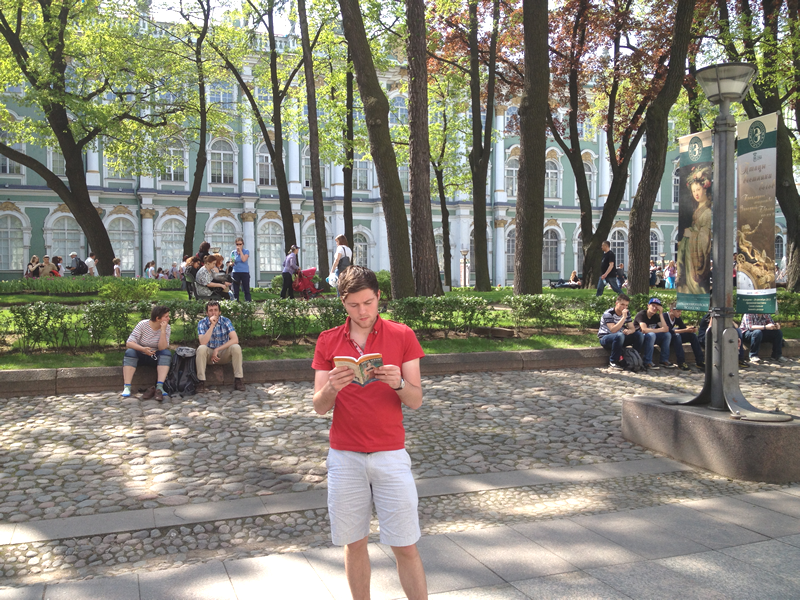 When I arrived in St. Petersburg at the beginning of the fall semester I had no idea what to expect. I had never been to Russia before and two years of Russian at Cornell didn't seem like enough to prepare me for life in Russia. The first few weeks were a little daunting, but it didn't take long to adjust. After a while I was understanding more and more of what people were saying, and that was very exciting. Speaking was and still is a challenge - anyone who didn't already recognize that I was a foreigner would as soon as I started talking. But Russians are not so unfriendly as people tend to think and were usually helpful and patient. The class on phonetics had the biggest impact in terms of how I was using the language outside of class: I felt like I was finally being understood more clearly. The program itself was a great experience. There are a lot of language classes, but American students are also able to take regular academic classes in English or Russian. Taking a class in Russian was maybe the most helpful thing I did towards improving: it's not as scary as it might seem, and professors are very accommodating of foreign students trying to take classes in Russian. And, of course, living in St. Petersburg for four months is an incredible opportunity. It's one of the most beautiful and exciting cities in Europe, but it's also surprisingly cheap and very easy to get around. After just a year of intensive basic Russian at Cornell, I jumped directly into researching and working in the Russian-speaking world for the entirety of my 2014 summer. 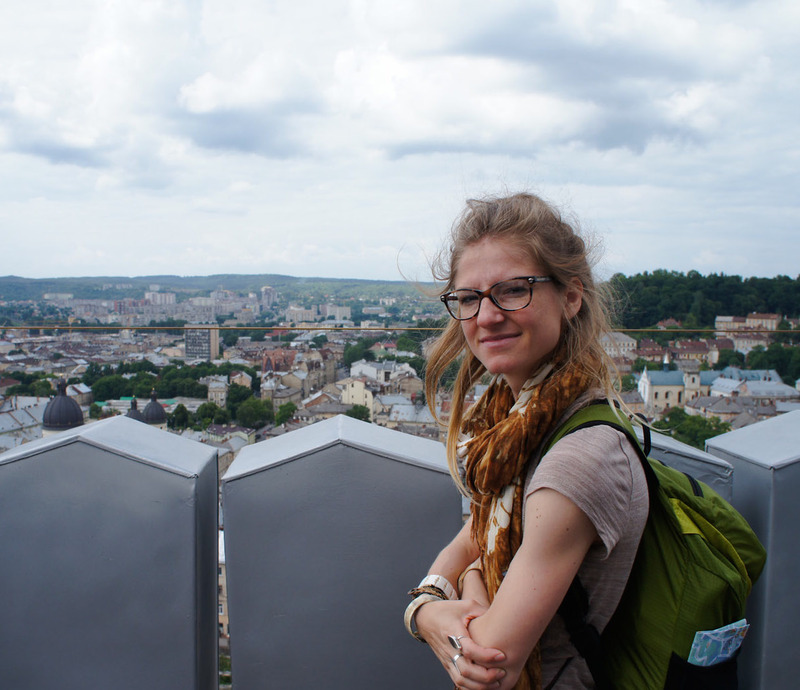 In May I flew into Kyiv, Ukraine to work on a month-long pre-dissertation research project supported by the Cornell Institute for European Studies Manon Michel Einaudi Research Grant. Meeting my professor that I was to work with from the Institute of Archaeology of Ukrainian National Academy of Sciences at the airport was a bit intimidating, but soon after meeting him and spending a few days getting acquainted with the city, I felt very comfortable to begin practicing my Russian. I credit so much of this to Ukrainian hospitality, which allowed me to feel very welcomed in both my new neighborhood where I lived near Livoberezhna and the institutions that I worked with. I study Late Antique and Early Medieval body adornment of modern-day southern Russia, Ukraine and Central Asia so I spent time examining objects relevant to my research project in the museums in Kyiv, most notably those at the Museum of Historical Treasure of Ukraine. As far as using Russian, I felt that I still overthought my grammar and vocabulary. My Ukrainian professor encouraged me to just speak, not thinking about whether I used the imperfective or perfective aspect or whether my endings were exact. He assured me that this would all come naturally with practice. 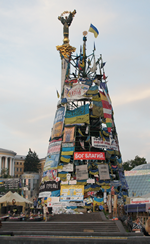 It was towards the end of my time in Kyiv that I began to finally just try to speak without inhibition. 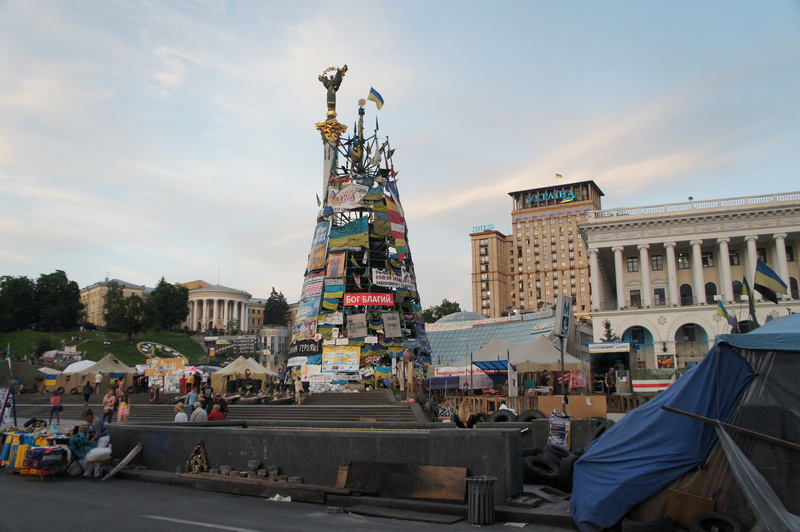 Luckily while I was in Ukraine, the political tension did not make a presence in the capital, despite the still ‘fortified’ state of Maidan Nezalezhnosti and Khreshchatyk Street in the center of Kyiv. And of course, I found plenty time to enjoy the city as well. I made several good friends after visiting Kyiv for just a week last summer and we stayed in contact. This year when I arrived I was warmly welcomed, and like last summer, I joined them with an interesting cultural event or urban adventure nearly every evening. A few memorable events were a talk by a Dutch scholar on abandoned industrial architecture in southern China, which took place in a massive gutted Soviet Era edifice, and a documentary (with the director present) on the gas lines running from Siberia all the way into Germany (called ‘Pipelines’ by Vitaly Mansky, which I highly recommend!). My closest friend, Gala, lives a little outside of Kyiv, so I was also able to explore the more rural regions with her and on my last weekend in Ukraine we went to Lviv, which was absolutely beautiful! 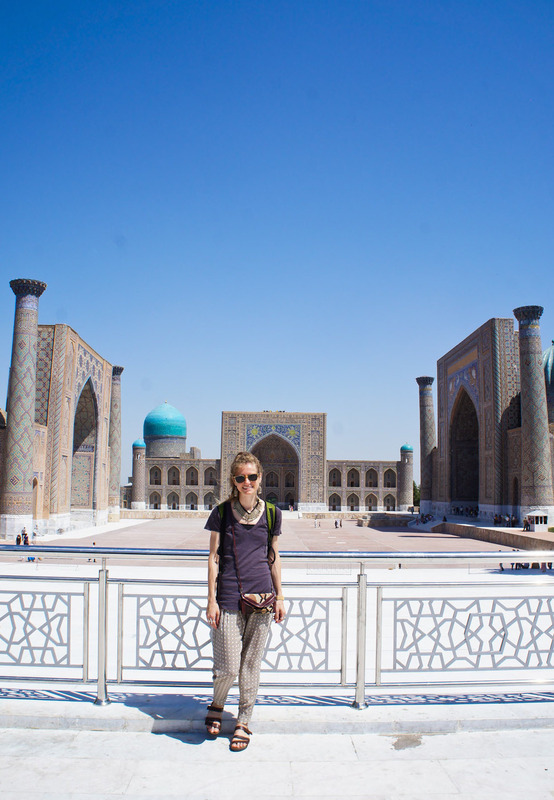 On June 24th I flew to Tashkent, Uzbekistan via Moscow for the second part of my summer. As an art historian and archaeologist I usually go on excavation every summer and this year I worked on a mid-first millennium CE Sogdian fortification in the Bukharan Oasis. While in Uzbekistan I was able to visit Tashkent, Samarkand and Bukhara, but the vast majority of the two months was spent in a small village of the Navoi Province near our excavation site. Working in Uzbekistan is what really improved my Russian. In Kyiv I had the luxury of my professor being able to speak English or my friends always wanting to practice English in the evening. On the other hand, in Uzbekistan I was forced to use Russian. It was our language on the field and at the dinner table. Both our Uzbek and Russian colleagues spoke very little English, so using Russian for communication was absolutely necessary. 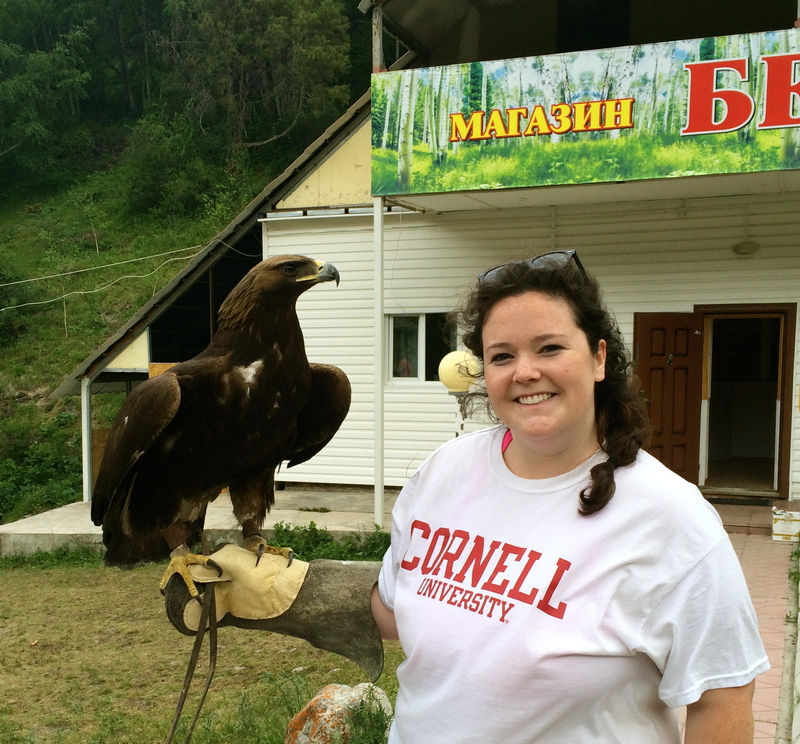 I participated in an 8-week summer internship program in Bishkek, Kyrgyzstan run though Bard College and the American University of Central Asia after four semesters of Russian at Cornell. The program provided the opportunity to take language classes, a seminar class on Central Asian history and the region’s economic future, and to work at a NGO on various different types of projects. Going in to Bishkek, I didn’t know much about the country of Kyrgyzstan other than that Russian was spoken which made my summer quite an experience. I’m not even sure how I can describe it in a few paragraphs. The country itself is 90% mountains (the Tian Shan range goes through the country), guaranteeing a marvelous view from every spot and justifying its nickname of the “greenest city in the Soviet Union.” There are great trails for hiking and beautiful lakes for swimming. Even after spending a month in the country, I was still finding myself surprised and interested in simple daily activities due to how drastically different life there is. 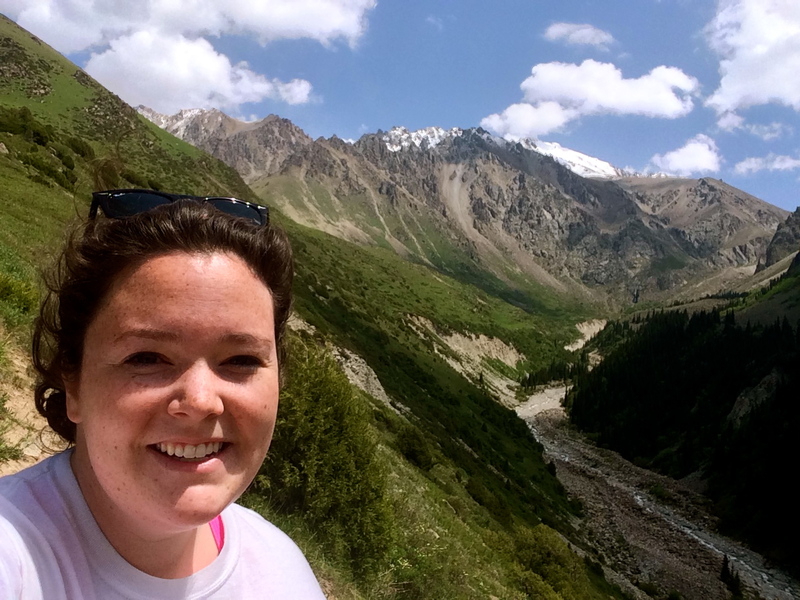 Living in Bishkek required a lot of adjustments ranging from getting used to eating food that I couldn’t easily identify, to living in a Muslim society, to drinking hot tea with every meal even if it was 104 degrees outside, and to surviving in a city I didn’t know with absolutely no English. For anyone looking to improve his or her Russian skills, Bishkek is a great place to visit that will force you to practice the language. My specific internship was with the Tian Shan Policy Center. I was researching access to education for primary school aged children with disabilities. As a developing post-soviet country, Kyrgyzstan still has great strides to make towards making itself accessible and fair for people with disabilities. I had the opportunity to meet with members of parliament, one of whom was born blind and was able to give me a first hand look on what growing up with a disability in Kyrgyzstan means. Outside of working on my internship I took classes at the University, which resides in the building that used to be the government headquarters during the Soviet Union, and traveled around the country on most weekends. We went to Osh (Southern Kyrgyzstan), Naryn, Issuk-Kyl (giant lake near China), and many other small villages. 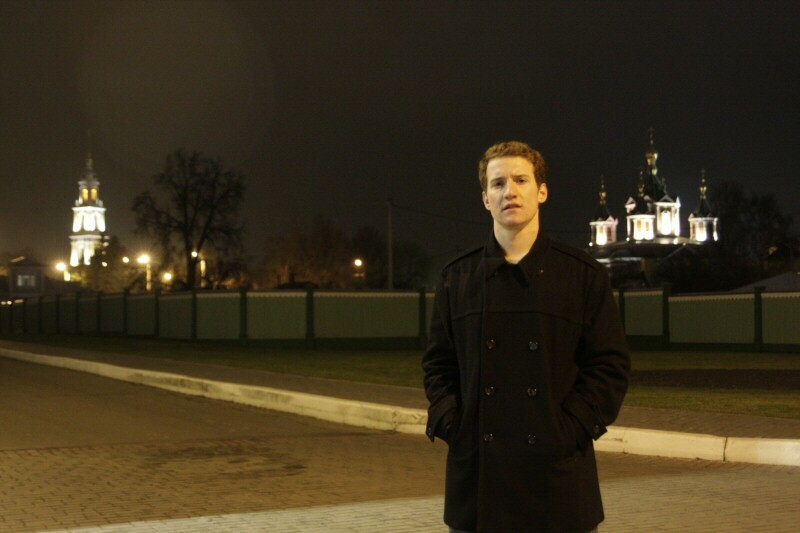 It has been a year and half now since I left Russia and every day I dream about going back. If you had told me that Russia would be the country I would long to return to three years ago, I would have laughed at you. Who wants to go to Russia? Before I left, everyone I knew told me about how cold it is, how unfriendly the people are, and that the only sustenance was borsch and potatoes with a bottle of vodka. And while the last point may be true, I do miss putting sour cream on all of my foods. I was fortunate enough to spend my time in Russia living in Petersburg and Moscow, as well as a month at a dacha outside of Moscow. 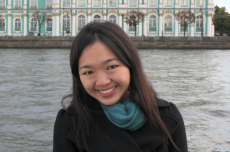 I studied at university, I worked for a small company, and I vacationed in the countryside. Everywhere the people were incredibly welcoming the more time I spent with them. But no matter where I visited, my heart stayed in Petersburg. In Petersburg I danced in a plaza with old people to classical music blasting from a small radio. They took the time to teach me how to waltz and tango, and I spent a few evenings with them after that dancing in the street. I was able to watch the bridges of Petersburg go up, stranding me on the mainland and dooming me to 6 hours spent in a Kofe Haus till they went back down. I attended a punk opera reimagining of the epic Medea that involved men with spaghetti strapped to their faces playing electric guitar as a woman covered herself in glue. I discovered how bad I was at chess when I decided to play an old man in the park. I experienced the white nights, 24 hours of uninterrupted daylight when everyone hangs out on the streets and all the cafes open up patio seating so you can enjoy the days. I also lived through 24 hours of darkness and -20C temperatures for a whole month, the same month in which I coincidently noticed that nothing warms you up like hot tea and soup with sour cream. In these days, Barack Obama bar became my home away from home. The city of Petersburg itself is gorgeous. In my opinion, it rivals and bests Paris and Rome as the most beautiful city in Europe. Nevsky Prospekt, the Yusupov Palace, Peterhof, the Hermitage, etc. can compete with the Eifel Tower, Champs Elysses, and Louvre any day of the week. The entire city center has barely changed since the late 1800’s. The ballet, opera, and symphony are affordable events that people go to. During my time, I learned to love the ballet and in my second semester I missed only a handful of shows. To anyone studying Russian at Cornell, I believe it is imperative that you spend at least a semester in Russia. I say this not only because living there is the best way to learn the language, but also because it is impossible to learn the language without experiencing the culture first hand. I studied in the Bard-Smolny program at St. Petersburg State University for one year. During this time I studied the language, the history of Petersburg, poetry, and 20th century Russian literature. The staff at the university is excellent, and to anyone afraid of taking classes in Russian, it takes a month at most to understand what is going on. I left [Ithaca] as one of the worst speakers in my class and within the month I felt comfortable with the language. Most importantly, I now know the difference between ы and и. 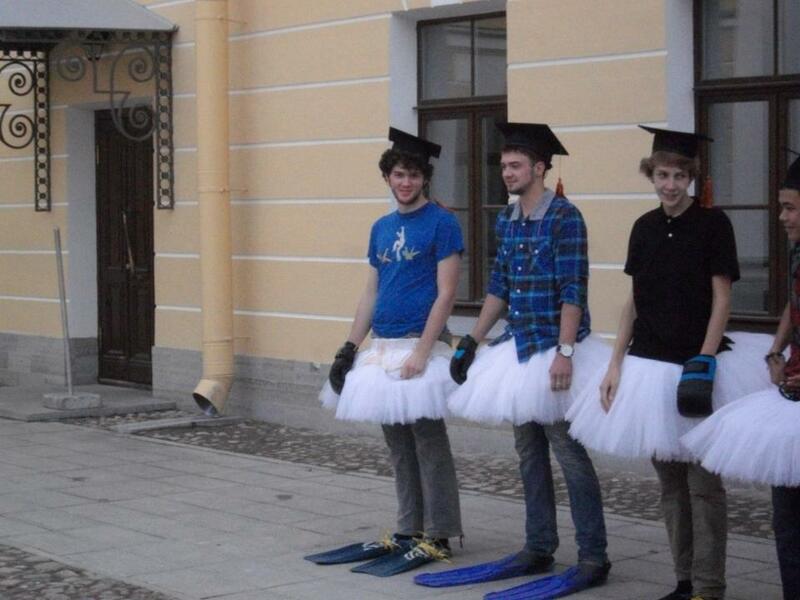 First of all, SURF is not a traditional study abroad program. Established by Stanford students in 2008 after the Georgian war, SURF’s aims are to foster communication between America and Russia by giving American and Russian students ways to connect and discuss international relations issues affecting both countries. 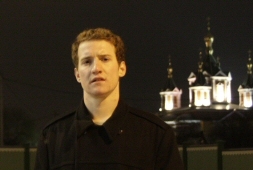 The program hosts two international relations conferences, one in the fall in Moscow and one in the spring at Stanford. In Moscow the Russian and American students meet one another and attend talks on current international relations issues. Between the two conferences, students are expected to work in groups of two Americans and two Russians on a policy proposal, which they then present in the spring at Stanford. Thus, even though the program only meets physically for two weeks out of the year, it also involves a substantial amount of work over the winter and provides a lot of good opportunities for virtual and real-world interaction with Russian students. There are a lot of benefits to doing SURF, although in my opinion, the best things about it are not immediately obvious. First of all, it is a great option for anyone who wants to do study abroad, but is nervous about going to Russia for a whole summer, semester, or year. The Moscow conference is just a week long, so it is a great way to get a feel for Russia before making the decision to live there for several months. Another great thing about the program is that it can be done on top of usual coursework. Thus, it is a really good option for anyone who feels (like I did) that they have too many commitments/course requirements at Cornell to be able to be away for a whole semester. It is also incredibly cheap (if you get in, the only thing you have to pay on your own is airfare to the two conferences, and even then you can apply to have that covered by financial aid). Finally, and I think this is the best thing about SURF by far, is that by the end of the program, you will be close friends with many Russian students. 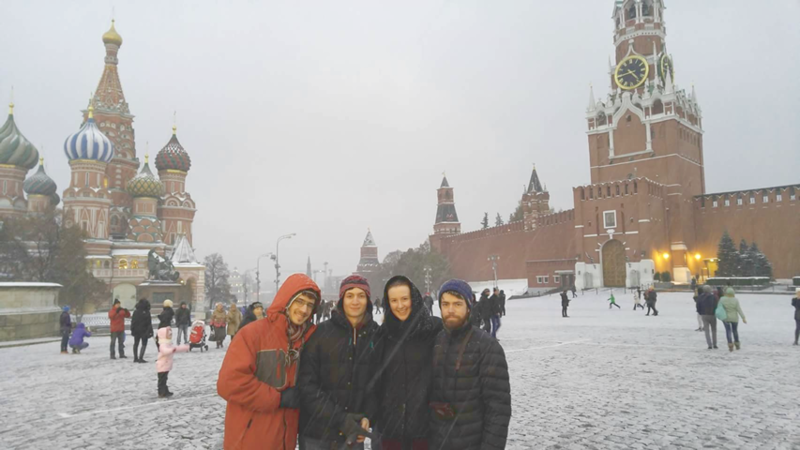 Unlike other study abroad programs, at SURF, Russian and American students are equals. The Russians are not hired as tutors or language coaches. In fact, they face a very similar application process to the Americans, attend all the same events, and collaborate on the same projects. This level field makes it very easy to get to know Russian students personally, especially the two students with whom you will be doing a research project. Another added plus is that many of the Russian students are Moscow natives, which means that if you make an effort to get to know them outside of the program’s structured activities, you will get to see a more authentic and personal side of Moscow that many Americans will never get to experience. The Russians you meet through SURF are also self selected—these are Russian students who are interested in politics, really care about their country, know their country’s history, and aren’t afraid of discussing difficult issues or telling you if they disagree with American (or Russian) policies. For all these reasons, it is very easy to have meaningful and interesting conversations with the people you meet at SURF, and to forge lasting friendships. When I went to Russia a second time, I already had a network of really great friends in the country because of SURF, and I still keep in touch with SURF friends to this day. This kind of close personal interaction between Americans and Russians is unique and one of SURF’s best assets. In my opinion, the only downsides to SURF come from the American end of the program. When I did the program, I found the Moscow conference a great experience and the Russian students very interesting, but I really disliked the Stanford conference and was disappointed by the attitudes and motivations of many of my fellow American students. Many (but not all!) of the Stanford students running the program were very vocal about their high opinions of themselves and their institution. Their boasting was particularly unpleasant, especially because Stanford’s resources so obviously surpassed any kind of educational opportunities available to the Russian students in their home countries. SURF also taught me that I was not really interested in becoming an international relations minor or working in international relations in the future. The kind of long-term historical questions I was most interested in were not covered by the SURF program, and I found many of the speakers (especially on the American side) rather disappointing. In Summary: Do SURF if you are seriously interested in International Relations, want to meet Russian students and get to know them, and want to spend only a short time in the country. Don’t do SURF if you want a longer-term language intensive program, or if you already know you aren’t particularly interested in IR. First of all, I loved this program. I did the 5 week option, but if I could do it again, I would definitely have chosen the full summer option. The SLI is clearly a language program (unlike SURF) and definitely study abroad—you live with a host family, and 5 weeks is the shortest option. The program is located in St. Petersburg, which is THE place to be in Russia in the summer. 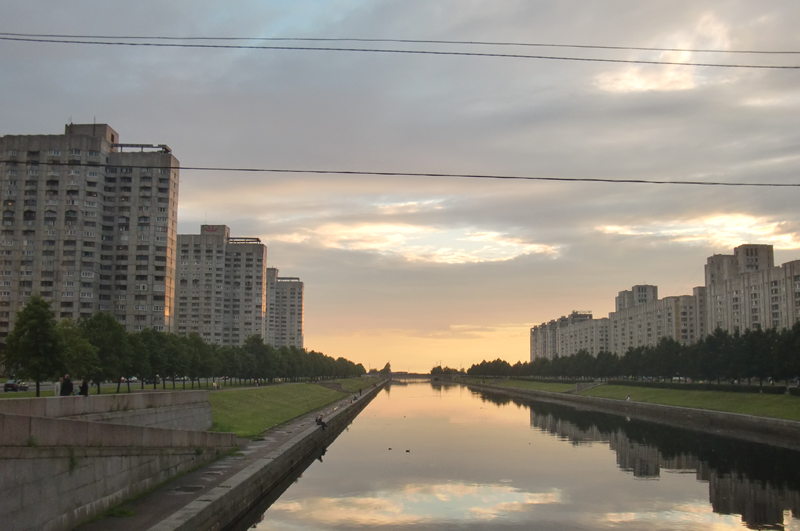 Petersburg is so far north that during late June and early July, the sun hardly sets at all, resulting in “white nights,” three weeks or so when the entire city just doesn’t seem to sleep at all. Since the sun set at 11pm or midnight for most of the time I was there, I got a chance to spend time exploring the city without missing class or skimping on homework (although skimping on sleep…that’s a different story). The language intensive program involves taking 3 different language classes, five days a week, as well as an elective history or literature class once a week (taught in Russian). The wonderful Olga also arranged excursions for us within Petersburg and a weekend trip to Novgorod (a really cool city which was one of the highlights of the summer). All the classes and excursions are conducted in Russian, and there is a Russian only policy at all Smolny events (more on that later). Although there were more formal scheduled activities than I might have liked, the excursions are fun and interesting, and the teachers/staff are very accommodating if you have to miss something as long as you plan to make it up afterwards. The host-family living can be hit or miss, but for me it was a definite plus. It can be hard to get used to being dependent on your host family for dinner, laundry, etc (especially after living independently). But, it is well worth it to get to know your host family and spend time talking with them. I found that practicing Russian with my host mom and dad was one of the best ways for me to learn, since neither of them spoke a word of English. Talking to them was also a fascinating cultural experience—my host dad showed me how to clean and salt fish he caught in the Neva, while my host mom taught me how to make different soups and told me stories about growing up in “Leningrad” over dinner. I also really enjoyed the area of the city in which I lived. I was placed in one of the soviet-era residential parts of Petersburg. Although it was externally very intimidating and ugly, I never felt unsafe and I got to experience a side of Petersburg that was definitely not touristy. There was a canal and a park very close to my building where I could go running and sit outside watching people and listening to conversation. I also think people I met (shop attendants, waiters, etc.) were much nicer in my area of the city, precisely because it isn’t a touristy place. Ironically since it was a “language intensive,” I think my least favorite aspect of the program was the language class. I went after having taken 3 years of Russian at Cornell, and I think the language classes would have been more useful if I had gone after only 2 years of college Russian. I felt that I learned a lot more Russian from simply walking around Petersburg, talking to people, and watching terrible Russian cop shows with my host mom, than I did in language class. I also wanted to spend time doing research in the Petersburg National Library for my history thesis, but found it hard to do because of how much time I had to spend in language class. That’s not to say that the teachers weren’t good—in fact, they were excellent. But I think that after you have reached a certain degree of fluency, you learn much faster outside the classroom than in. My favorite class was the elective history class, which was taught by a history professor from Smolny college, not a language instructor. I barely understood half of what he said in lecture, and had trouble keeping up with the reading, but since we were talking about topics in which I was very interested, I got a lot out of the class and was highly motivated to learn. The other problem was that I found it hard to connect with Russians in the way I had at SURF. We had several Russian students assigned to our program as language tutors, but it was difficult to talk about serious topics with them or connect on a deeper level, since they seemed more like TAs or summer camp counselors than peers. Ultimately, Smolny (like many other study abroad programs) is really what you make it. If you go and spend all of your time with other American students (which it is easy to do, since as I mentioned earlier, meeting Russians is hard) you will end up speaking English (no one takes the language pledge as seriously as they should), going to American ex-pat bars, and eating at McDonalds. If you go and spend your time differently, you will learn an incredible amount of Russian and have a fantastic experience. My advice: go to American Councils English conversation hour to meet Russians (if you go, you will be instantly welcome as a native speaker, and afterwards the Russians will want to get to know you better, hang out, and help you with your Russian), spend a lot of time with your host family, see plays in Russian (theater tickets in Petersburg are ridiculously cheap), and talk to EVERYONE (my experience was that Russians are only nasty to you if you speak English to them, or meet them in really touristy areas of the city). Avoid everything American like the plague, and whatever you do, don’t speak English, not even to your fellows Americans when the teachers aren’t listening. The summer is short, far shorter than a semester, so you really have to make every moment count. In Summary: Do the Smolny summer language intensive if you are at an intermediate level of Russian, can’t go abroad during the semester, are highly committed to learning Russian language, and are willing to go out of your comfort zone to have outside-of-class Russian experiences. Don’t do Smolny SLI if you are not prepared to really work hard over the summer and challenge yourself. Also don’t do Smolny SLI if you are interested in Russian politics/international relations/history but have no intrinsic desire to learn the language. A couple of weeks ago, I ended my second and last semester in St. Petersburg. My junior year abroad, living for two semesters in the Capital of the North, was in many ways an incredible and unforgettable experience. I arrived in the middle of August for the introduction program of Smolny College, which is the liberal arts and sciences division of the St. Petersburg State University. Before I went I was doubting for some time whether to go one or two semesters, but I quickly decided that I would go for the entire year. Looking back I am very happy I did so for several reasons. Although I enjoyed the first semester for the discoveries, the new friends, and new experiences I made, it was my second semester that was the best I have had so far. During the spring, I knew all the best places in town, I knew where to go with my friends I had made before and I finally became able to speak freely with Russians I met on the street or in the bars. But let me start with the beginning: arriving at my host family in the suburbs of St. Petersburg was definitely an experience. Luckily I had taken 2 years of Russian at Cornell, so I was able to read and write and I knew the basics of the grammar and speaking. Communicating freely, however, was a completely different story. Fortunately my host family was very welcoming and my host mother took good care of me. It was in their apartment where I truly learned about Russia, the Russian culture and the language. During my language courses at the university I learned grammar and writing, but the best practice was definitely at home. For future students, I highly recommend living in a host family, because the fear of not getting on well with them (although those chances are actually very slim), does by far not outweigh the advantages. My friends who did not stay in host families had trouble getting to know real Russia, and their language progress was definitely slower than average. Academically speaking, my program was well organized and of high standard. Of course the school was way smaller than Cornell, and of course not all the courses were as demanding as in the States, but the course offering, the professors and the staff were all of good quality. During my second semester I also took an Economics course in Russian where I was the only foreign student. Although I did not get every single detail, I was very happy to see I could understand the professor and the course material and improve my language skills at the same time. The best things about my year abroad were the gorgeous city I was able to live in for a year, the amazing cultural heritage at my doorstep, and a nightlife that was better than anywhere else I had experienced. The city center consists of many magnificent palaces, and the parks in between are just as gorgeous, especially in the spring when all the flowers decorate the city parks. Consequently the cultural heritage in St. Petersburg is also immense. The Hermitage, the best museum in the world in 2013 according to Tripadvisor, is just one of the many amazing collections of art, and with a student card I could get into all of them for free! Besides that, I attended many amazing ballet and opera performances, and also the music ensembles in the parks were really good. During the weekdays I went to the cinema, to the banya (the Russian bath houses), and sometimes to the bars, but it was during the weekends when I had the most fun. The club scene is amazing, the music is great, the atmosphere fantastic and the nights very long; and be honest, who would not like to dance at an underground party in an old abandoned palace with a view over the main boulevard and the river Neva? From sunny celebrations of Russian maritime power on the waterways, to the sights of the city and through endless White Nights, the Saint Petersburg summer is both magical and electric. Living an hour by rail outside the city center, I learned the rhythms of the metropolis, the faces of commuters in the underground, the words of everyday living. 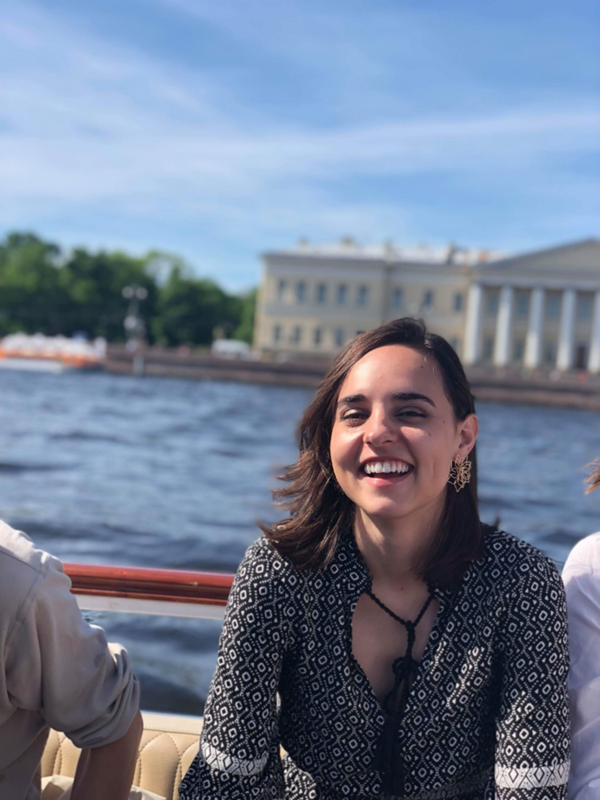 The experience of eating, sleeping, breathing, and living Russian was unforgettable, and I learned so much during my stay with the Smolny Summer Language Intensive program. ~I. It's so difficult to sum up an entire summer in Russia in a paragraph or two-there are so many delightful moments experienced over the course of any semester abroad, and in my case there are so many I'd love to share! 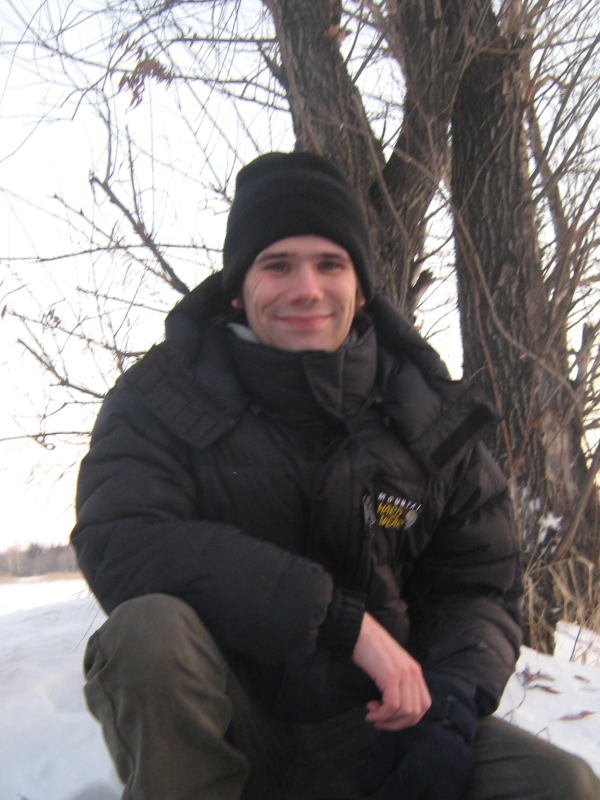 I spent the summer of 2009 in Kaliningrad, Russia, thanks to the CLS scholarship. 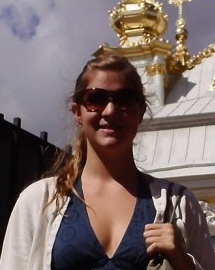 I went abroad in spring 2010 to Saint Petersburg, Russia through the CIEE Saint Petersburg program (www.ciee.org). 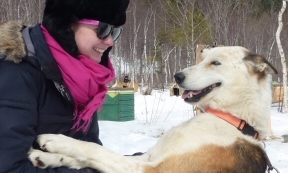 Despite being there during the coldest winter since the Leningrad blockade, I had an amazing time! Russia is a fantastic country and the CIEE staff constantly worked towards sharing its passion for this culture. Meeting new friends in a new context, you learn much about yourself and put your American lifestyle in perspective. 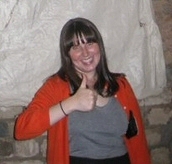 Needless to say, it is one of the most enriching semesters I’ve had as a Cornell student! Thus I recommend this program very warmly. It was an incredible experience that was facilitated by the outstanding CIEE staff. Everything was done for us to feel comfortable all the while living in a drastically different country and culture. The CIEE Program is extremely well organized to help the students in all their needs. They take care of the housing / dining and prep us seriously for life in Russia thanks to an intense two day orientation at the beginning of the program. In addition, CIEE gives each of its students a Russian student card, making most of the museums free. It also has a cultural reimbursement program, which partially reimburses opera, theater, movie tickets as well as museums. The classes were thrilling and I made significant progress in Russian. All the professors from this program are incredible and interested in making you progress as much as possible over your time abroad. SPbGU professors have been in the States and know very well how to work with foreign students. The work is essentially done in the classroom, which allows the students to enjoy their free time once classes are over. 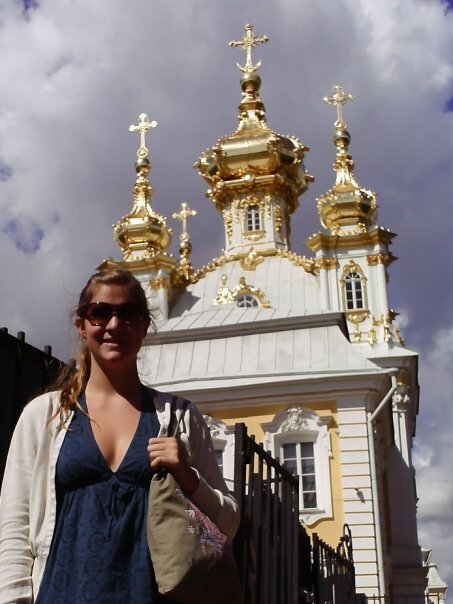 Studying abroad in Russia was one the most fascinating and meaningful experiences I've ever had. 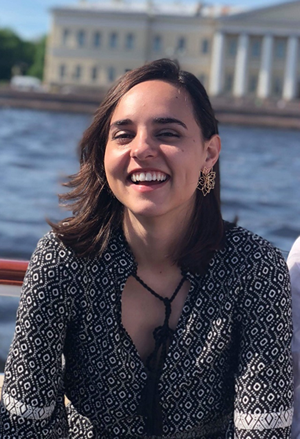 The Fulbright English Teaching Assistant (ETA) Program is an excellent way to live in Russia outside of Moscow and St. Petersburg and offers you the opportunity to teach English at an institution of higher education while concurrently pursuing independent research in your ample free time. 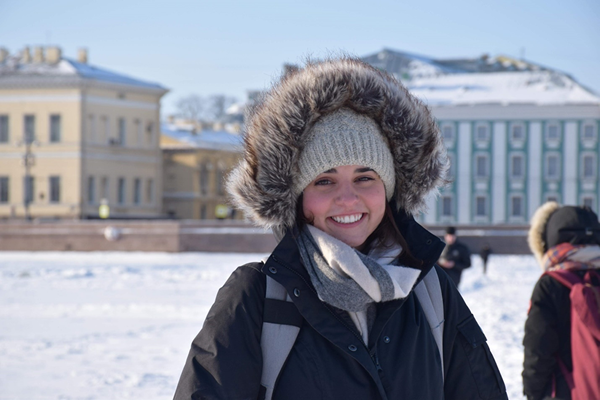 An experience in Russia is unlike any other study abroad; you'll grow academically and personally as you live in a country with a history, language, culture, and economy radically different from the United States'. My stay in a provincial city in the Moscow Oblast was at times challenging, but extremely rewarding. I was in close contact with the city's population and made significant progress on my Russian. For my research, I was able to speak with almost twenty veterans of the Second World War on their experiences and reminiscences. Outside of my work, I pursued a wide range of activities with Russian friends, including cooking, swimming, going to sauna, martial arts, gardening, and ice-fishing. I studied in St. Petersburg through Smolny College in spring 2008 and chose to extend my visa and remain in the city for an internship through August. Living in Russia, first taking classes alongside Russian students, then working in a Russian office, was invaluable in solidifying my language base and in adding further depth to my cultural understanding: the videos we watch in class do little to prepare you for the quirks of Russian culture. If you choose to study in beautiful St. Petersburg (and I strongly recommend you do), Smolny is an outstanding program. It has a strong cultural program and support staff, as well as language-intense classes. Daily Russian as a Second Language (RSL) classes, taken in conjunction with academic classes taught in Russian, was perhaps the most effective means of strengthening my language abilities. My internship proved invaluable in furthering my understanding of Russian culture and expanded my vocabulary in unexpected directions. 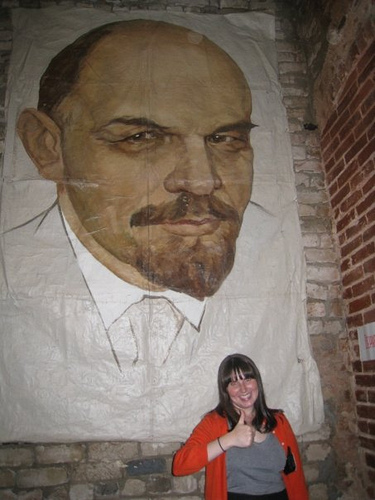 In the Spring Semester of 2006, I studied abroad in Moscow, Russia through Cornell Abroad in the American Councils Russian Language and Area Studies Program. I will always be grateful for having made this choice, because it opened the door to me for many wonderful experiences afterwards and helped give me skills that I use to this day. It was also simply a thrill to live in a big city, especially one in a country with so rich a history and endlessly interesting people to talk to and learn about! 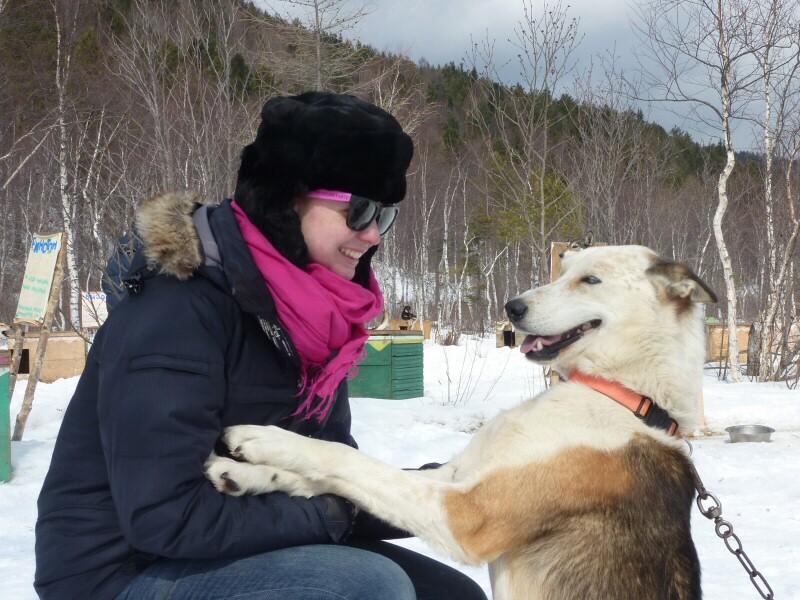 I spent most days learning how to survive the cold Russian winter (luckily if you have spent any winters in Ithaca, you are already almost prepared enough for Russian winters!) and going to language classes at Moscow International University. There, some very demanding but wonderful teachers worked with us students on grammar, conversation, Russian literature, Russian history, phonetics, media studies, and geography. We also had opportunities to travel, and I went with friends to Riga, Latvia. In the spring our entire program traveled through southern Russia, ending up in the city of Sochi, on the Black Sea. These aspects of the program were very valuable. But the hardest and most rewarding part of studying abroad was learning how to fit into another culture and to communicate outside of classes and tourist activities. I lived in a host family, and it was through conversations and activities with them, through laughter and sometimes disagreements, that I learned about what Russia means to the people who live in it. 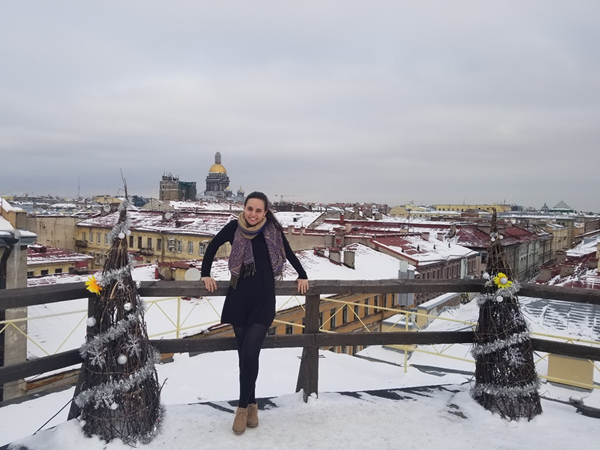 I learned more about how Russia has changed and is changing than I could have any other way, and I also learned a great deal about our own country by having the chance to see it through the eyes of others. I already really enjoyed my Russian classes at Cornell, but studying abroad inspired me to delve deeper and major in Russian. After graduation, I worked as a research intern at the Library of Congress, translating Russian-language archival material. Following that I decided to pursue an MA in Russian and East European Studies at Georgetown University. 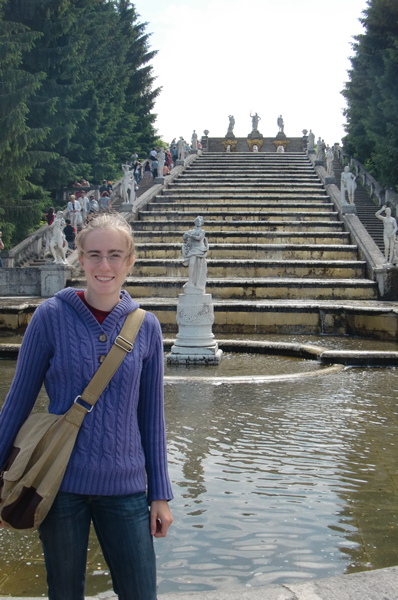 I used Russian language in my work at all stages of that program, and the insights I gathered during my Cornell study abroad have helped me to identify and complete several interesting research projects. I have traveled further and done research in Eastern Europe. 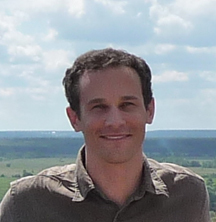 Currently I am pursuing a PhD in political science at the University of Pennsylvania, where I hope to focus my research on the politics of religion and ethnic identity in Russia and East/Central Europe. I would like to stress that my study abroad experience was absolutely key in building my language ability to the point where I am now capable of pursuing the research I want to do. It shaped my interests, and helped define for me what I want to do in the future. I highly recommend taking full advantage of your opportunity to study abroad while you are at Cornell! When I stepped onto Russian soil for the first time in August, I was excited, nervous and anxious that I hadn't spoken the language all summer. I looked forward to the Smol'ny program's Russian as a Second Language course to resurrect all the vocabulary and grammar sleeping at the back of my mind. But soon enough, I realized that my real language classroom is not Smol'ny, but the city of St. Petersburg itself. Now, two months later, I have bargained at a flea market, sat through history classes conducted in Russian, debated homosexuality with my host mother and played Russian Scrabble with my new friends. St. Petersburg prides itself on being the cultural center of Russia and I am still amazed at how, in the city center, nearly every turn of the corner brings you to a sign that declares "Here lived Pushkin/Dostoevsky/Nabokov..." My student ID guarantees free entry to the Hermitage, where I plan to spend many hours when the days become inevitably colder and darker. The notorious weather gets to me sometimes, but the Russian people's warmth — not to mention the devilishly delicious pancakes, candies and cookies — keeps my spirits up. I’m currently spending the 2010-2011 academic year in Omsk in southwestern Siberia through the Fulbright English Teaching Assistantship (ETA) program. As I write this, I’ve been here for about three months, and already my time in Russia has been one of the most amazing and enriching experiences of my life. Russia can be a challenging place to live, especially outside of the confines of the more internationally-oriented areas, but even if you choose a Moscow- or Petersburg-based program, try to get away from these two metropolises (or better yet the whole of European Russia) for at least part of your visit. As exciting and majestic as the capitals can be, they are only two small parts of a huge and diverse country, and experiencing life elsewhere will do wonders for your understanding of Russian language and culture. As any Siberian will tell you, the "real" Russia starts east the Urals, and nothing can compare with browsing the local rynok (or market), convincing your friends and colleagues that you really are bundled up enough to go outdoors, or being questioned by the police in a city where many have never met a proper foreigner. Despite the preconceptions that most Americans have about Siberia, I feel incredibly lucky to have been placed in Omsk--the site of Dostoevsky's pivotal 4-year imprisonment, the former seat of the White Russian government, and a closed city during the Soviet era--in no small part because of this.